If you have cracked, chipped, or weak teeth, then you need a viable way to strengthen your teeth and restore the beautiful aesthetics of your smile. There are a variety of reasons why your teeth may be weak, but if you choose a high- quality provider of dental crowns, then you can rest assured that your teeth will be strong and restored. Allow our dentists of Fairfax, VA to show you how crowns work and how they can restore your smile by utilizing dental crowns. Why Are My Teeth Worn, Weak, or Chipped? If you have cracked, chipped, weak, or decayed teeth, then a set of dental crowns may be the perfect solution for you. Dental crowns are coverings made of porcelain which go over your entire tooth, giving them both renewed strength and a natural aesthetic. In the past, most crowns were made of metal. However, with new advances in dentistry, metal crowns are a thing of the past. In fact, your crown will look exactly like a natural tooth, retaining the same strength as your original tooth enamel while also being more resistant to cracks and chips. With E4D equipment, our dentists will be able to create your crowns on-site instead of having to send them to a laboratory. This means that you will be able to get your new crowns quicker than ever before! 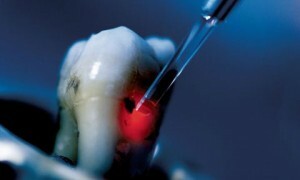 This laser-guided equipment will snap images of your tooth, design your crowns, and create your crowns in about an hour! When we use CAD-CAM scan technology, our dentists will be able to virtually eliminate the process of taking impressions of your teeth. Not only is this easier for you, it is also a more accurate way to design your crowns. Therefore, you can rest assured that when you get dental crowns, they will fit perfectly, feel natural, and restore your teeth! When you choose us, our dentists can promise that you will receive only the most exemplary treatment. Our dentists put your individual needs at the top of their priority list, and they will find the most accurate and beneficial solution to your smile problems. Our dentists offer a variety of services designed to address each and every one of your problems. If you would like to see a full list of our services, please review our dental services page. If you would like a complimentary consultation with one of our dentists, please call our office today at (703) 997-0928.